Blowing Rock maintains an impressive selection of some of the most distinguished homes in the western Carolinas. Blowing Rock is home to the world-class Chetola Resort, which spans 87 acres in the Blue Ridge Mountains, and is adjacent to a 3600 acre national park. Chetola features luxury accommodations, a full-service spa with fitness center and indoor heated pool as well as elegant, waterfront dining on Chetola lake, featuring first-class regional cuisine. Guests and village residents enjoy the many recreational activities offered at Chetola Lake, including lakeside performances by the Symphony, paddle-boating, canoeing and trout fishing. For golf aficionados, be certain to visit the Blowing Rock Country Club, established in 1915, this private club has become a true destination for mountain golf, and features a challenging 18-hole course designed by Seth Raynor. For tennis buffs, the Blowing Rock Country Club has four har-tru tennis courts, and offers a variety of events and instruction for men, women, youth and couples. Start your home search below and if you have any questions please contact us. 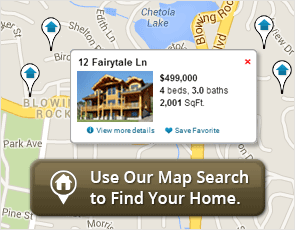 View the most recent listings below or click search to see all homes for sale in Blowing Rock.